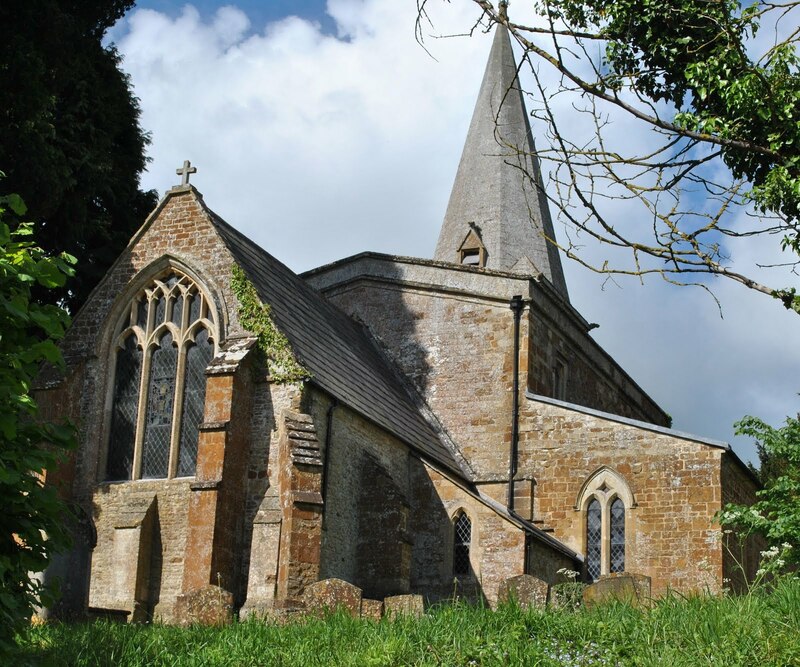 Sunday started as Sunday should -- with services at our village church -- St. Mary's. The one that is across the lane from Blue Row. The one whose bells remind us hourly of the time. And what does one wear for church in England on Sundays? Wool -- for warmth. For even on a warm day, old churches are cold -- too many stone surfaces and no real heating most of the time. Warm socks are even advised! 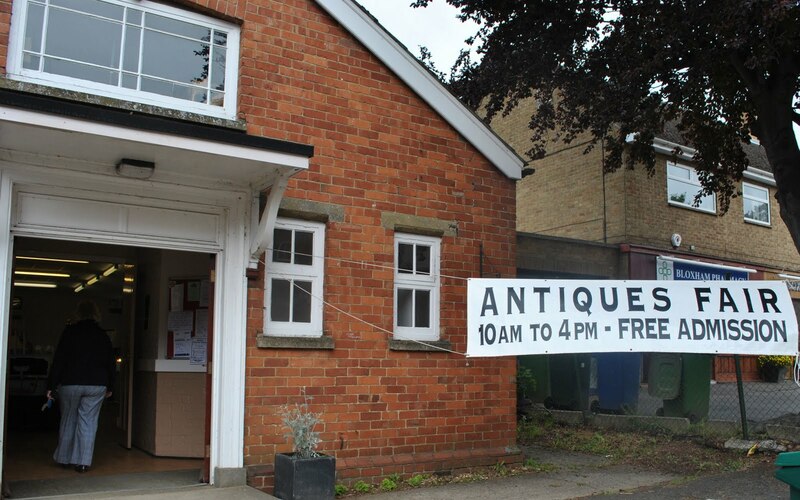 An antiques fair!!! And yes, I found something but more on that later! 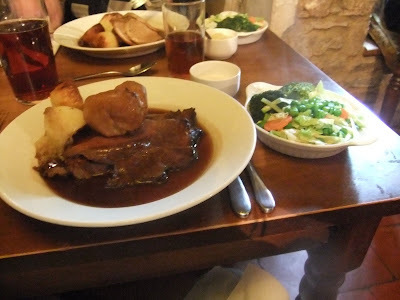 After the fair, we headed for the town of Great Tew because it was Sunday and in Britain, Sunday is the Sunday Roast at the local pub. The Falkland Arms. 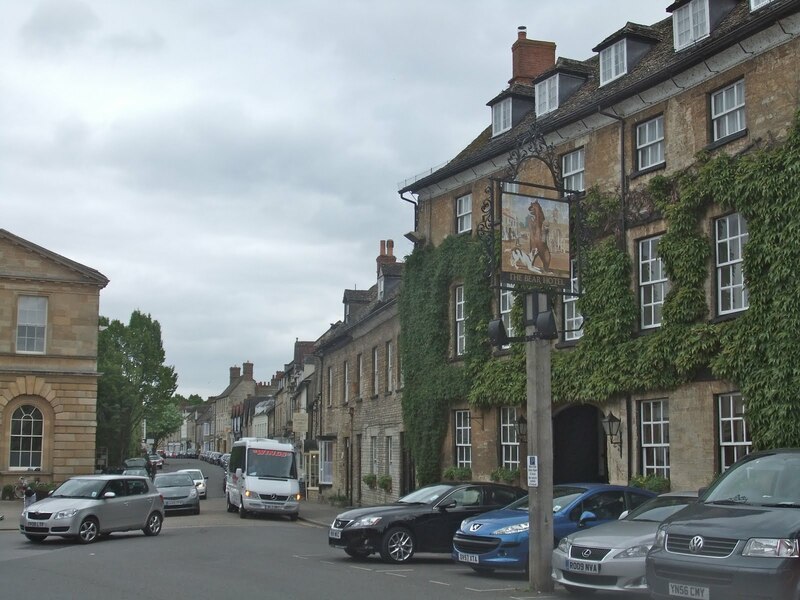 A 16th Century public house with low ceilings, stone floors, and mugs hanging from the beams. 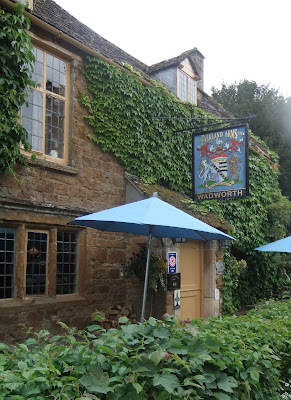 It was a great pub and, according to one of Husband Jim's travel books, had one of the best Sunday Pub Lunch in the area. Where we did some antique shopping. We have found that "Antique Centers" are more our style than "Antique Shops" but the two shops in Woodstock were a true treasure trove. With an unlimited budget I would have filled at least one carry bag. I, did, however, find a treasure that did come home with me. We then headed back to Great Tew. tea provided by the ladies of the church to raise money for the organ fund. 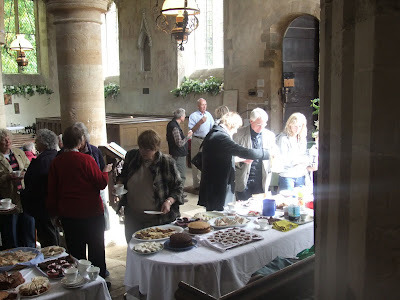 We gladly participated in all of the great homemade tea treats -- sandwiches, cakes and scones! And tea. And in England, feeding the multitudes in church involved brewing the tea in real crockery tea pots and serving the tea in real tea cups. And cutting the crusts off the sandwiches and cutting each into 4 pieces! 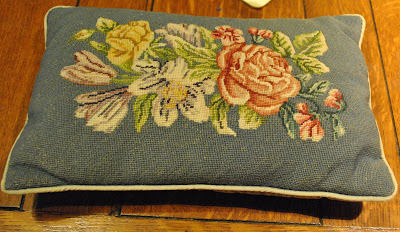 This wonderful petit point needlepoint pillow. Not sure of it's age -- probably 60's but the work is exquisite and for $15, I could not do it myself. I have an idea of where to put it when I get it home to Linderhof! And my Antiques Fair purchase? 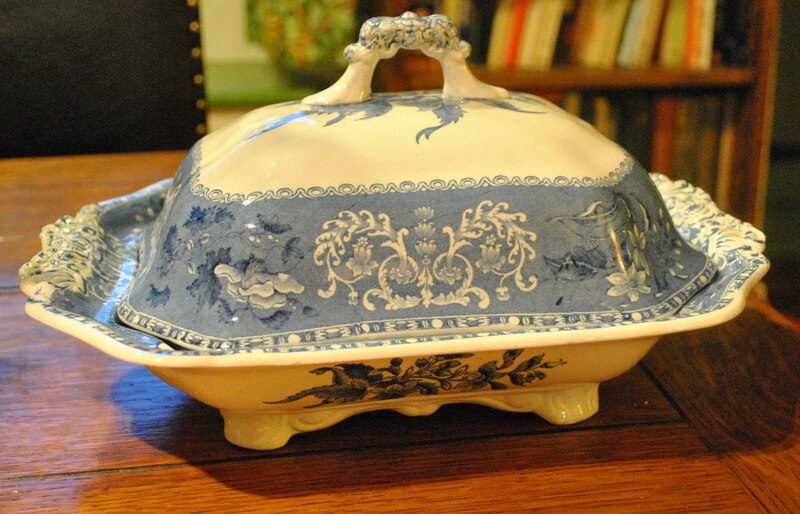 This wonderful Spode Camilla covered vegetable dish from the 30's. 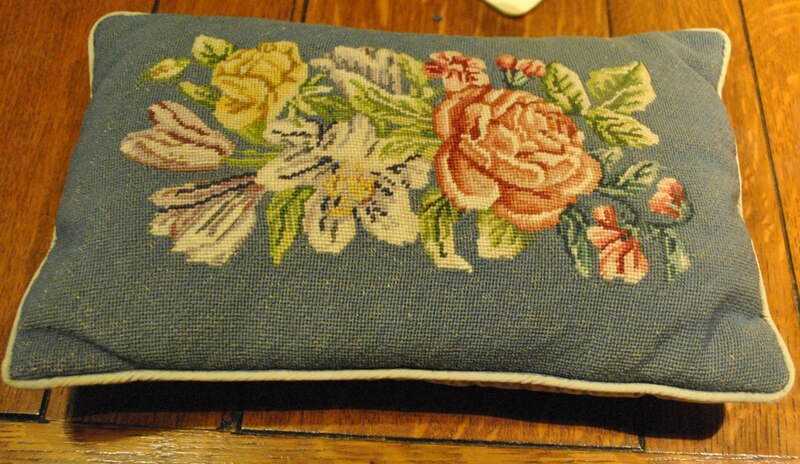 Blue and White which should pair well with my Spode Blue Italian covered vegetable dish whenever we have large dinners. It's as pretty on the inside as on the outside!!! The price was 49 pounds which actually was not a bad price for it . . . but it was the start of the fair and I went back and looked at it 3 times. I truly wanted it, but bringing breakables home sometimes is daunting and I wasn't sure that I wanted to do that. The dealer, however, said that she would do me a good deal and would I be interested in 35 pounds? I didn't hesitate!!! She provided bubble wrap and I'll hand carry it in my carry on when we fly home. What a wonderful remembrance of our month in England! 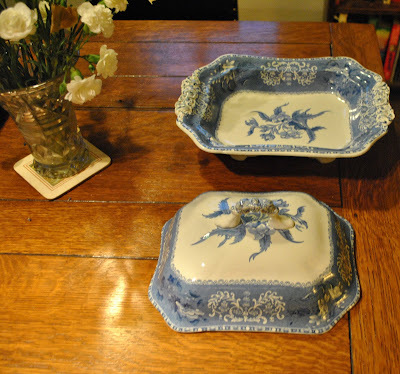 My two new treasures -- both blue -- I'm sharing with Smiling Sally for Blue Monday. Please visit her and see all the other blues this Monday! I love your two blue treasures! You are having such a marvelous time in your English 'home away from home' and I love the whole concept! What a lovely Sunday! Worship, luncheon, shopping, music and tea! Abit of "Heaven on Earth"! I'm sure you felt blessed, indeed! I am enjoying your trip to England so much! I was there many years ago and visited many of the same places. Scotland is fabulous also! 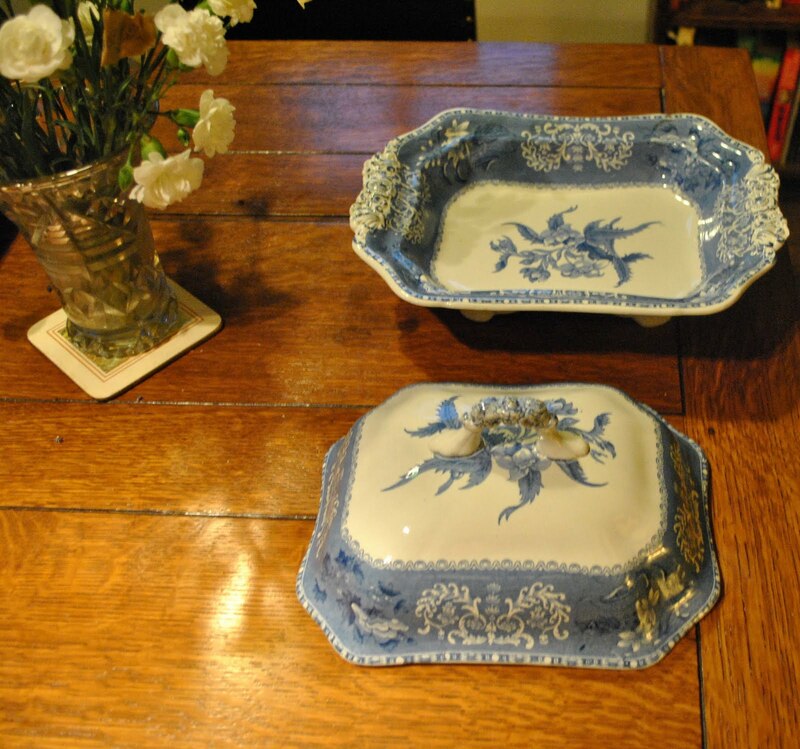 I also collect blue transferware and you found a real beauty! Can't wait for your next post! Have a wonderful time. What lovely treasures you found! Good for you. 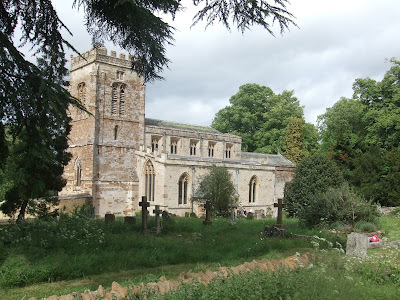 :) Wonderful Sunday and love the stone churches. Martha, are there any special tea sandwich fillings you would recommend? I am to do the refreshments again Friday night for another art show. Any super-easy and delicious tidbits? Looks like you had a fantastic time. Lovely blues too. what a busy, and fruitful, Sunday you had! I love that Spode. Thanks for sharing your blues. Oh my where do I begin, truly a Sunday to remember forever. The antique "finds" are just fabulous, that lunch looks soooooooo good, YUM, and what fun having tea at St. Michaels. I would love to hear what kinds of goodies were on the tea table. I think I recognized someone in the photo??? I have never made Yorkshire pudding before but remember a segment on MS, a Thanksgiving or Christmas segment, her guest's name escapes me but she was English and it looked easy. You have inspired me to make it when I do a Pot Roast the next time. Oh, what a great Sunday, I'm so jelous of this trip! I love your veggie server with the lid, t's going to look great at Linderhof, plus the memmory; just gorgeous! You did wonderful things this Sunday after worshipping. I love you went shopping, music and tea...what else can you ask for in life! God bless. Great treasures! The roast beef looks so comforting...yes reminds me of Sundays of my childhood.